Home » 2010 Minutes » Mt. Pleasent Speedway Fan Club Day! Mt. Pleasent Speedway Fan Club Day! 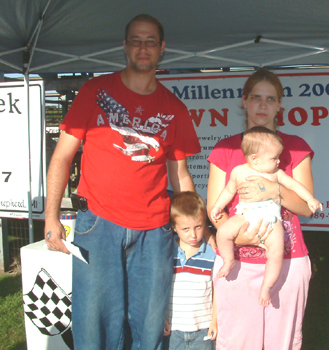 Friday night July 23rd saw the club beat out bad weather predictions around the state for a great night of racing at the Mount Pleasant Speedway. Kenny and Larry Letts along with Board Member Chuck “Choo Choo” Horan and VP “Wild” Bill Barnhart manned the membership table along with yours truly “Da Prez”. What a great night to see so many MARFC Members at this racy dirt track located right in the heart of the state. 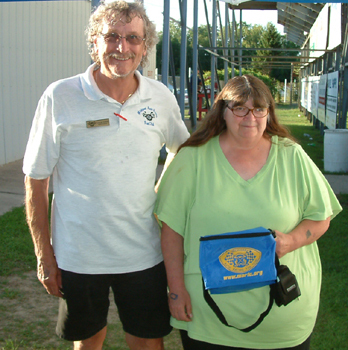 Randy Kretzinger, driver of the #57 Stock-Mini was selected by the track to receive the MARFC Helmet Bag. Kretzinger, of Holt is in his second year at Mount Pleasant and was involved in a horrific racing accident a few weeks ago resulting in a series of barrel rolls and flips that destroyed his ride and took the jaws of life to extricate him from his car. In true racers spirit though, he has come right back in a borrowed car and carried right on as if nothing had ever happened. Jackie Nelson of Cadillac was the winner of the MARFC member raffle prize. Track announcer Leo “Chief” Pego conducted a moment of silence for Ed VanDuinen who passed away last week and has been instrumental over the years with the MSPA, MMA, and for many years owning the Merritt Speedway with Wife Carmen. Many thanks to Betty and Mario Crook for having the club out and to the “Chief” for the great PR on Friday night, it was great to visit with all of our fiends at Mount Pleasant. Previous post Rain Cancels Galesburg MARFC Day! Next post Updated MARFC Events!